Equestrian sports are steeped in tradition. Hunting groups are resplendant and Dressage riders no less so. As a strictly governed sport, Dressage riders have a number of rules to follow regarding how they dress and behave. Dressage is judged subjectively, therefore correct turnout conveying the right impression are important. For Dressage competitions, riders will wear white breeches, never jodhpurs. The breeches often feature slip-resistant leather 'seats' which creates friction with the saddle to keep the rider in place. Breeches are worn with a belt and are complemented with a white shirt and a stock tie with a small pin, worn under the Dressage Coat. Dressage Coats are similar to Hunting Coats, usually solid black or occasionally navy, with metal buttons. The traditional Dressage Coat takes the form of a long jacket. In upper-levels of Dressage, riders wear a shadbelly or tailcoat with a colour vest or vest points at the front of the waist where the coat is cut short. Gloves should be white or a light colour, enabling judges to see subtle hand movements. 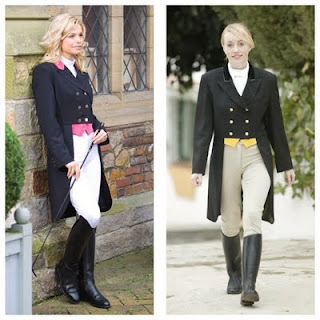 Tall boots or field boots are acceptable although upper-level Dressage riders will choose tall dress boots. Spurs are required at the upper levels and a whip may be carried in some competitions but are not permitted in Eventing Dressage. Long hair is usually secured with a hair net or show bow. A hair net will generally be chosen to blend with the hair colour of the Dressage rider, whereas a show bow is generally black. Lower-level riders will be required to wear an approved riding helmet. At the upper levels, a top hat to match the Dressage tailcoat is more traditional when show rules allow. Dressage tailcoats photographs are courtesy of Equetech and Shires. "I've started following and slowly getting involved in dressage. Last week I picked up my first Dressage Coat and was amazed by the strict rules and regulations that govern this and all aspects of dressage. Fascinating stuff!" Thanks for your comment, we hope you continue to enjoy our blog. I was watching the dressage from Kentucky on TV last night. Totally amazing! Britain did really well getting the silver.